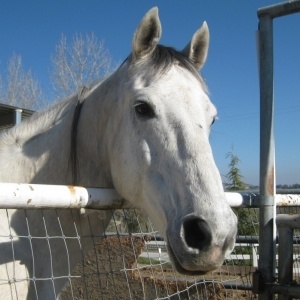 He was on Craig’s List being offered as a horse that could be ridden. A friend of Heaven Can Wait went to look at him and realized he was not meant to be ridden at all. Both stifles (hips) pop out of joint and he has what appears to be a once broken knee that did not heal right. He was brought to Heaven Can Wait; otherwise he might have had a horrifying death.